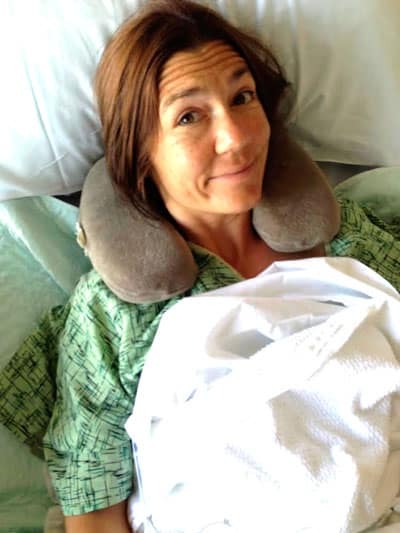 You are here: Home / Uncategorized / Kidney Transplant Update – Surgery Day! Kidney Transplant Update – Surgery Day! 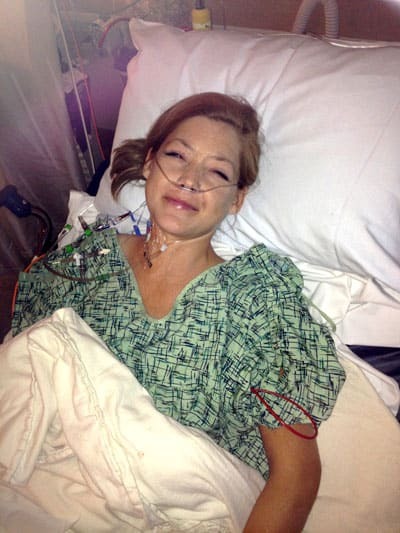 Thank you all who have joined my on my 2013 Flashback: Road to My Kidney Transplant! I have one more update after this – just in time for my 1 year kidney transplant anniversary! To catch up on my previous kidney post click here, to catch up on all kidney posts, click here. In September, my entire family was ecstatic after my sister Kimberly’s blood and my blood “played nice” and she completed all her tests to qualify as my kidney donor. We were almost set to schedule surgery; all we needed was the official approval of the Transplant Board. On approval day, I couldn’t stop smiling – telling everyone at work and all my friends that I was finding out my surgery date that day! And then there was no call and no call…and still no call. Finally, I called my mom who had just hung up with Kimberly who was crying on the other end. The Board said Kimberly was not approved because of a minor medical concern. She wasn’t ruled out, but a specialist’s opinion was required before the Board would make a decision. We would have to wait another two weeks for the next Board meeting for approval. 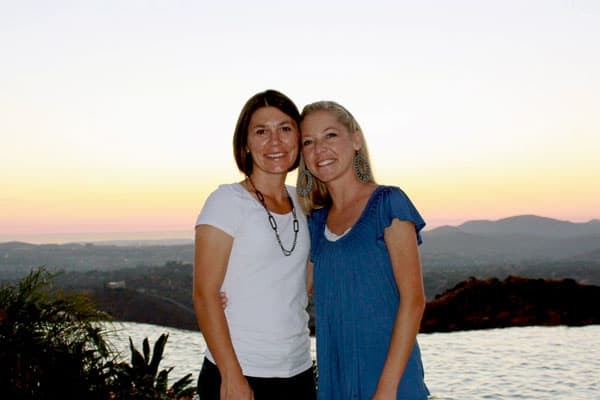 I was so touched Kimberly wanted so badly to be my donor – so I could feel better sooner – that she was brought to tears when that day had to be postponed…and Kim never cries…ever. Although we were all a little deflated by the news, we were still hopeful. Finally, after almost two weeks and the concern was resolved, I received the joyous news that Kimberly was officially approved by the Board and our surgery was scheduled for October 9, 2013. WAHOO! Me and my swollen feet were dancing on air! 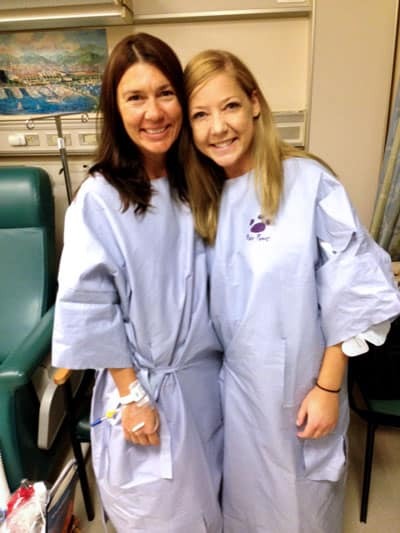 To prep for surgery, Kimberly and I each met separately with our surgeon who discussed all of the risks involved. There were a lot. 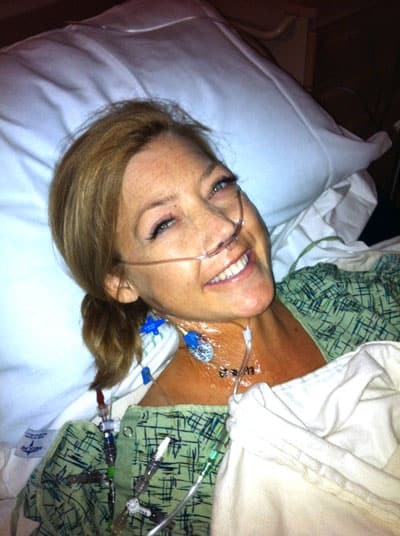 Thankfully, Kimberly’s heart is so big and so strong that she still wanted to move forward. She joked that she could use some quiet time to herself, to finally rest and put her feet up from all the craziness that being a mom to 5 kids brings; she said she might even ask if she could stay a few extra days! Six years my senior, I have always looked up to Kimberly from her inclusiveness as she let me tag along with her and her friends, to her gravity defying bangs in the 80’s (I could never get mine as high as hers), to her mesmerizing voice as she sang lead in the high school play, “Guys and Dolls,” to her jaw dropping beauty in that perfect blue prom dress, to her fast finger piano playing, to her gourmet cooking, to her patient parenting of one child…and then 5, to her mad multi-tasking of PTA treasurer, school room mom, church girl’s camp director, book club leader, soccer mascot poster creator, indoor soccer player, birthday party planner extraordinaire among a million other things! In short, I have always known Kim was a silent superwoman. Two days before surgery, Kimberly and I had our final blood tests to ensure my body hadn’t created any new antibodies that would attack the donated kidney. The blood still “played nice,” so we were ready to go! I woke up the day of surgery eager and excited! It seemed like forever since I could fit into my jeans, squeeze my feet into more than one pair of my shoes, paddleboard, sleep through the night (kidneys produce the hormone that helps you sleep at night), eat a normal diet (I could eat hardly any phosphorous – which is in everything! ), or simply walk around the block…and all that was about to change. 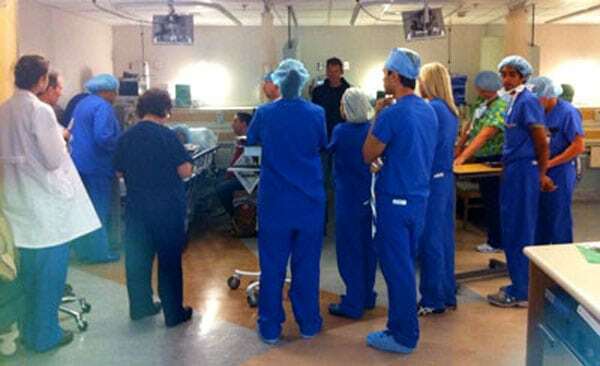 Kimberly, her husband, Spencer, my parents and my husband, Patrick, all gathered in the pre-pre op room together as Kim and I changed and they insterted Kim’s IV…and attempted to insert mine. We were then taken to the pre op room, where multiple nurses tried and tried again to start my IV, but even with the help of an ultra sound, they were unsuccessful –but not for want of trying! The IV would have to wait. We were briefed by the doctors who informed us Kimberly’s surgery would begin 30 minutes before mine, and then they would bring me back to a separate surgery room. When it came time to say goodbye to Kimberly, a simple “Thanks Kim” was all it took for the tears to start rolling down both our cheeks. She was giving me a whole new life and all I could think to give her was a gift basket (don’t get me wrong, it was an awesome, custom gift basket, but still!). 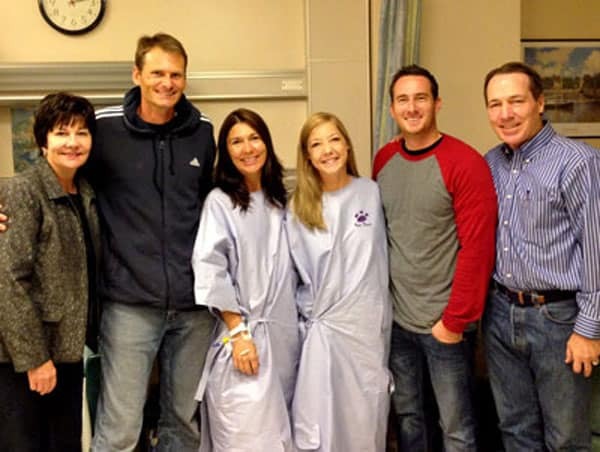 Graham and Jim, my living lung donors, and now Kimberly – I am forever grateful for these selfless heroes in my life! What can you give a person who changes your life forever? Words are never enough, gifts are never enough. Only striving to live a life that they can be proud to have made possible can scratch the surface of honoring such a sacrifice. I am forever in grateful debt to each one of them. There was one more round of “Bye,” “I Love you” to the rest of my family and then it was just me, a swarm of blue and white jackets, a long, cold table, and a towering robotic-like arm shining light down as if it was going to land directly on my head. I laughed when I saw this picture – I really am excited despite my “nervous” eyes! Because no nurses were able to successfully insert my IV previously, the surgical team inserted a large central line into my neck and then stitched it in place while I was still awake. Thankfully I was injected with a few good numbing shots first, but the pulling and tugging sensation of needle and thread in and out of my skin made my stomach crawl. 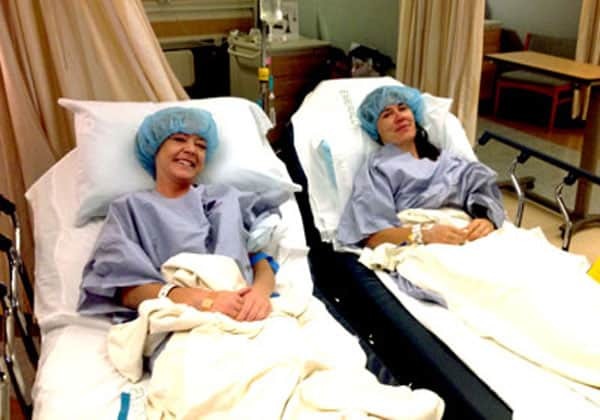 At the same time, they could do almost anything they wanted and I would still be smiling because I knew at the end there was a new kidney and a new life! Its extraordinary what we can cheerfully endure when we know there will be a bright outcome. I have found this to be true time and time again in my life as I’ve lost my brother to cystic fibrosis, faced death at age 16 due to cystic fibrosis, was saved by a living donor lung transplant, and faced multiple lung rejection episodes, and now an unknown future. In every circumstance, I am filled with peace and hope because I know we can all live together again as families and with our Savior, Jesus Christ and God our Father, and that we will be perfectly happy forever if we follow Christ – there is nothing left to worry about. At the end, there truly is a glorious new life for each one of us! Before my kidney failure, I didn’t know how important the kidneys are. The kidneys are considered the master chemists of the body. When they are working correctly, they remove wastes from the blood via the urine and return the cleansed blood back to the body. They regulate the levels of water, salts, acids and different minerals the body needs for good health. They produce hormones that control blood pressure, glucose, hemoglobin and other body functions. Many other organs also depend on the kidneys to work properly. Who knew?! Kimberly’s kidney had settled into its new home in my right lower abdomen, below a 7” incision. During kidney transplantation, your old kidneys are not removed, so I now have three kidneys. When I awoke from surgery, it was like a switch had been flipped – a new master chemist was back at work! I felt light, alert, and energized instead of heavy, fuzzy and fatigued. Pre-surgery, the toxins in my blood measured at 7.6 – they now measured 0.9. My “golden” kidney was working so beautifully that it had already flushed out 4 liters of fluid. As I gazed at my ankles, I didn’t even recognize my own body – they were so skinny. I couldn’t tell how skinny I had become while being insulated by 10 extra pounds of water. Now I could tell it was time to hit the gym and the protein powder. As Patrick and I talked, he was beaming ear to ear, we were both giddy! Oh how I love that man! I felt so amazing after surgery that I never even required any pain medication besides what was automatically administered in my IV right after surgery – no more after that, not even Tylenol. This is partly due to the high doses of prednisone (immunno-suppressant I was and am taking to prevent rejection) partially numbed the pain. I was still in some pain, but it was a dull ache that was only really painful to the touch or with the wrong movement. It was surprisingly even less painful than my laparoscopic appendectomy just a few months before. I was in heaven! 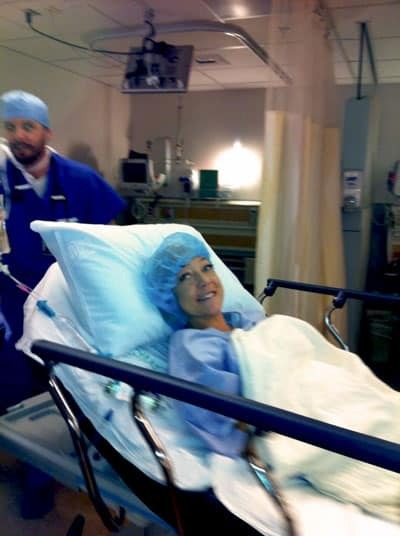 The day after surgery, while walking a slow hunched lap around the floor, Patrick and I came across my surgeon. 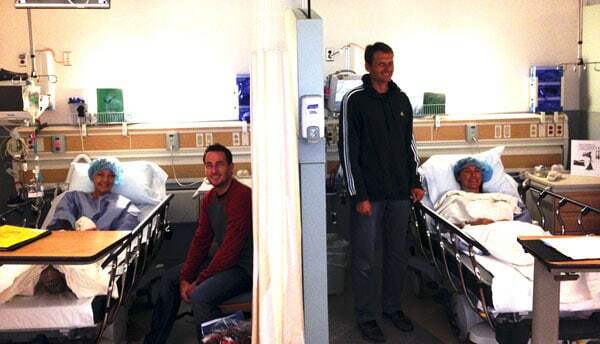 Upon seeing us, he immedialtey approached us, asked how I was doing and if we wanted to see pictures of my surgery? Patrick and I later laughed how he whipped out his phone and flipped through pictures of his daughter, daughter, son, dog, and then my new kidney. It was surreal to think that just 24 hours earlier, that kidney was functioning in Kim’s body and now was at work in mine. When we stopped by Kim’s room after our stroll, she wasn’t feeling nearly as well. My heart was heavy to see her extremely nauseous from the medication and in quite a bit of pain from the surgery. Her surgery was performed laparoscopically which requires the abdomen to be blown up like a balloon with carbon dioxide gas so the surgeon can more easily maneuver his instruments through the small incisions. Not all of the CO2 used is removed during surgery, however, causing a pocket of gas to rise in the abdomen pushing against the diaphragm and the phrenic nerve which can be agonizing. The gas will eventually be absorbed by the body’s tissue and eliminated through respiration, but in the meantime, while the wound is deep and the stitches are fresh, it can be very painful. 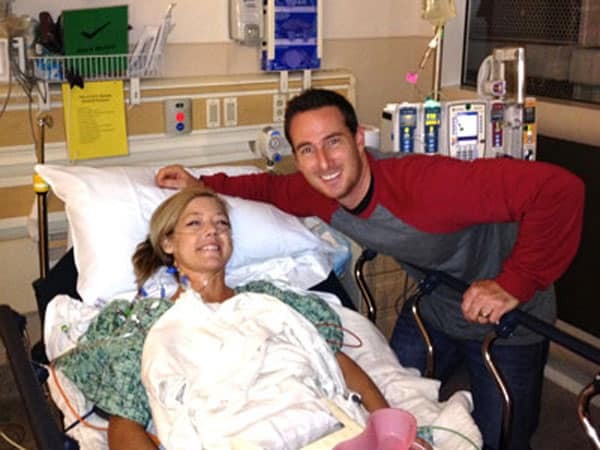 My heart skipped a hopeful beat the next day when my hospital door swung open and Kim walked in on the arm of her husband. But after sitting only a couple minutes and only able to utter a few words, she was too nauseous to stay. Before surgery, we had been told recovery is more painful for the donor than the recipient, but it was still difficult to see my sister in so much agony because of me. I knew she would get better, but I just wished my new kidney didn’t have to come at such a price. “Are you willing to forget what you have done for other people, and to remember what other people have done for you; to ignore what the world owes you, and to think what you owe the world; to put your rights in the background, and your duty in the foreground; to see that your fellowmen are just as real as you are, and try to look behind their faces to their hearts, hungry for joy. And for those receiving the love, the “small things” truly becomes great. Next Week: My final kidney post: Post Op and 1 Year Kidney Transplant Anniversary Update! Your are so kind Tammy, thank you for taking the time to read about my journey, I am glad you found it inspiring 🙂 I am blessed to be surrounded by some pretty amazing people! You and your strength, faith and optimism inspire me everyday! XOXOXO! Jen, God bless you and your sister! What a beautiful blessing your sister is, and I am so happy we all get to benefit by having your happiness and joy come through to our lives when we read your posts <3 Thank you for sharing your story and for being a wonderful inspiration! Thank you so much Marion, you are so sweet! Yes, my sister is such a huge blessing! She was before my transplant and now she is even more so 🙂 I am truly blessed! Thank you for your kind words. I am honored to rub shoulders with such wonderful people like you! Thank you for being an inspiration to me and I am sure to others. The trials you have been through and still are going through strengthens and encourages me. As a born again Christian myself, it is so uplifting to hear you witness to others. As I am going through some issues myself and know the reason I keep trying is because of God and his promise to us which we can count on 100%. It is not hard to have faith in good times but can be a struggle in rough times, which is when we really have to dig deep and put a “Yes” face on. You have made me hit my optimistic button and get out of my self-pity state. Thank you. God bless to you and your family and keep that wonderful attitude you have and may we always remember to give all the glory to Him. Thank you Justine, I do feel very, very fortunate to be alive thanks to the generosity of three different people. There are no words to express my gratitude! I am feeling great now and so excited to e sharing my cooking passion with you! Beautiful! Thank you for sharing. When I worked as a PA in nephrology, I was always delighted to see my patients’ dialysis chairs empty because they got that call for a kidney. This is wonderful insight to the side I didn’t get to see because I didn’t work at the transplant center. What a wonderful gift!. Your blog is full of talent and inspiration! Carrie, thank you so much for your kind words! I feel truly blessed and so grateful for this gift and miracle in my life. Thank YOU so much for all your work helping others as a PA. A kind face at the hospital works wonders! There is no doubt you were a blessing to many. Oh Julie, I am happy you reached out but sorry it is under these circumstances! I feel for your struggles and fatigue as well as waiting for the the unknown – that can be one of the most difficult struggles of all. I pray you will be blessed with a kidney match and continued strength, hope and determination in the meantime. God bless you! What a treat! I came to your site, it was to get the recipe for your oreo pumpkin cheesecake recipe that I saw on Pinterest. Then I started checking out your site, and was so interested to read about your kidney transplant.. especially since I donated a kidney to a woman in my town a little more than 2 weeks ago! Great story.. I’ll look forward to reading about your 1 year follow up! You are such a saint Corey! I hope your recovery is going well and that you continue to improve daily. Being on the receiving end of a kidney transplant I cannot tell you how grateful your kidney recipient must be – you have changed her life forever!!! Jen, thank you so much for your testimony I found you tonight at I was rereading a recipe I pinned some time ago. Some may say it is a coincidence but I prefer God-incident! My husband is 6 weeks post liver transplant. Through God’s gracious mercy we have been given this chance to further give Him the glory and serve Him My husband had his surgery at UCSF and we are so grateful to their wonderful staff and our donor, of course I have heard many transplant stories but I think ours is the most amazing I have read, Three live donors! Wow! I hope that the future brings you much joy! Hi Terri! I definitely believe in God-incidence – I am so happy you found my story! What a miracle transplants are! I am so happy for you and your husband and his second chance and am so grateful for modern technology and medicine that have made so many transplants possible. May God bless you both with continued health and happiness! Dear Jen, Like many others I came to your blog from Pinterest to look for recipes (and I have pinned quite a few!) and then I read your post about your kidney transplant. I am so moved at the courage and generosity of your sister and your love for each other. I have a similar relationship with my two younger sisters and would do the same for them anytime and know they will too. So inspiring to read about your unflinching faith in Jesus. Thank you for sharing your story and God Bless. Hazel. Hi Hazel, thank you so much! A sister’s love is a beautiful, powerful gift. Your sisters are so blessed to have you! I am honored you were inspired by testimony of Jesus. He is my rock, my everything. Thanks again for taking the time to comment. May God bless you and yours as well! how can i find out if i am compatible to my husband? Hi Paulina! There are several factors but first you need to be the same blood type. If you talk to a kidney TX specialist, they can definitely set you up with the correct tests. All the best!